In just a few short hours Mom, Bro-in-law, and I will be checking out the new Star Trek movie! A continued Mother's Day treat for Mom, who is really excited to see it. She texted me last night to say she was watching the first one to get ready. We are going to see it in 2D, as none of us are really swayed by the allure of 3D. I'm pretty sure it is going to be great either way. I'm super excited for Benedict Cumberbatch as I absolutely love him in BBC's Sherlock. 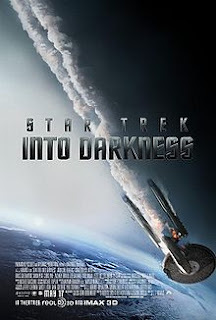 Are you planning on seeing Star Trek Into Darkness? Do you like 2D or 3D? After the movie we are heading to Applebees for early bird specials! So excited! Yes, I'm planning on seeing Star Trek and the 2D version (3D gives me a headache). Just have to decide WHEN to see it. Sounds like you have a fun day planned! Enjoy. I love him in Sherlock as well. Have a great weekend. It really is great. So much fun to watch. Thanks! I still haven't tried a 3D movie (I don't go to the movies that often). 2D was very exciting, so not sure what I would be missing without the 3D.